"The more I talk about almost taking my own life when I speak at suicide prevention events, the more I understand that I am only still here by the grace of God. We have got to bring mental health and suicide prevention out of the dark so that others who are struggling or suffering can see that there is always hope. While we cannot get back those we have lost, perhaps as a team Team Phoenix can help honor the memory and lives of those we have lost to suicide. When we take to the ice, I believe they will be with us." -Jeremy Holm, Team Captain and pilot for Team Phoenix Bobsled. In the United States, a person dies by suicide every 15 minutes, claiming more than 36,000 lives each year, according to the American Foundation for Suicide Prevention (AFSP). It is estimated that an attempt is made every minute, with close to one million people attempting suicide annually. Suicide is the fourth leading cause of death in the U.S. among adults 18-65, the second leading cause of death among teens and young adults, and individuals ages 65 and older account for 16 percent of all suicide deaths. As a team, Team Phoenix has decided that during the 2013-2014 Season we will dedicate a portion of our sled's paint scheme to honoring and remembering those who we have lost to suicide by listing their individual names. This effort will help us defeat the stigma's surrounding mental illness and raise awareness of educational programs about prevention, warning signs and the psychiatric illnesses that can lead to suicide. 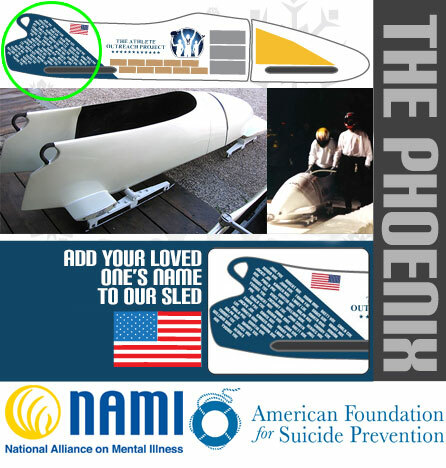 If you would like to submit the name of a loved one or friend who you have lost to suicide for consideration to have their name placed on our two-man Phoenix bobsled during the 2013-2014 season, please fill out the form below. Do We Have Your Permission to Post This Data?